My dear friend Mary came over again last week to teach my little girls and me how to knit the purl stitch. She is such a kind and devoted friend and her children are absolutely wonderful. Her daughter is so sweet to take the time to teach little Maria how to knit the Knit stitch. Mary drives over 45 minutes to get here and usually stays for about 2 hours, which is never long enough. We really enjoy their company and I always learn so much from her. She let us borrrow some really nice bamboo needles and some really awesome knitting books. We are so incredibly blessed to have her living here so close to us. This morning we had the pleasure of having a very dear friend come over to teach my girls and me how to knit. I knew I would have a difficult time learning how to knit, but Mary is an amazing teacher and was very patient with me. Angela and Cecilia, on the other hand, picked it up very fast. I can't wait to be able to curl up on the couch with my girls and knit. 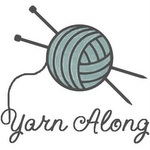 I'm linking up with Ginny for this week's Yarn Along. What are you knitting and reading this week?